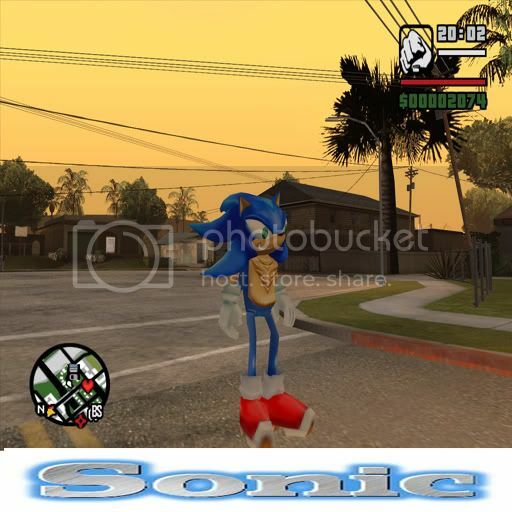 I finally got Sonic into San Andreas. DOWNLOAD NOW AVAILABLE. HAVE FUN!!!! DONT FORGET TO POST ANY COMMENTS OR TROUBLE HERE. Thankssss guysssss . I'm making the rar right now for you all to download it. Ill post it really soon. 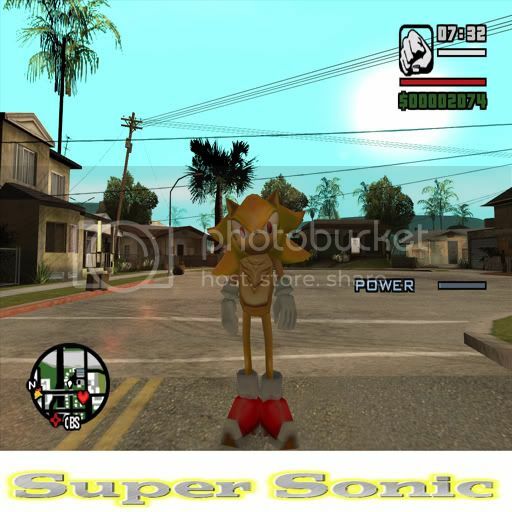 His face needs a little work,but it looks like it's been converted from Sonic adventures 2. Yes, I will be making shadow. 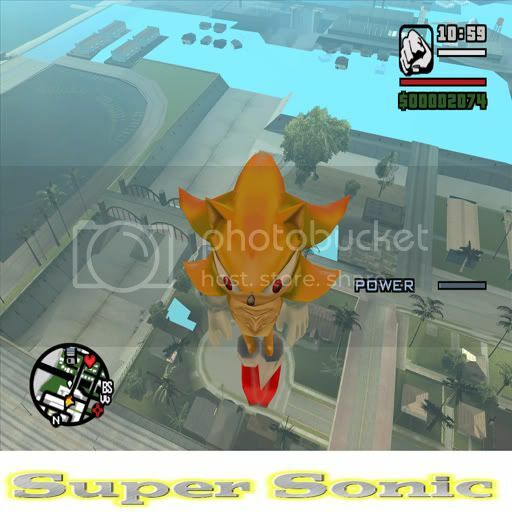 This was not converted from Sonic Adventure 2 lol the model and skin was made by somoone else (RUSSIFICATOR ([email protected]) and I cant get a hold of him. Got denied trying to upload the mod lol so until I can get a hold of him I'll just continue making it better. It is the shadow model, sonic's hair goes down when he isn't super. Yea, I noticed that too. Before I rigged it to bones I tried flipping them upside down but it didnt look good. It would look better like this, shadows hair is more or less rigid, sonic's isn't. Are you gunna make a shadow with the roller blading anims? Ill definitely look into that. For sure I'll make a shadow/supershadow skin. I was also thinking about making a jumping animation where you can do a front flip as sonic. Nice, Midnightz has a roller blade script, maby you can get him to help you? Oh? Thats really cool. Send me the link to that I want to check that out lol. It hasn't been released yet, but maby you could PM him to ask? I should that would be really cool having an animation like that for shadow. The only problem is that I like Sonic more so I have to make a cooler animation for him too lol. UPLOADED PICS SCROLL UP. Enjoy them for now because I can give the download yet LOL. LOL. Yea, instead of putting it on GTAGarage I'm thinking I just might upload it here. Thats a good plan, maybe more people will see it here. wow, how much RAM do you have atm? I have 256MB and i can play SA. 256 ram, but i cant play it, i've got an intel pentium 3 proccesor, 851 mhz. Yes, and no, you need, obviously cause i have it, 256MB RAM, and 1Ghz processor, i have an AMD Duron, its 1100Mhz. He would look better if he was a shorter and had the hair on his chest gone. Yea, my thoughts exactly!! Once I get the download posted, after making a shadow, I'll do just that.